Maximum size: 100 mm (Kay, 1979). Identification: This species has densely papillate rhinophores and extensive ramifications of the digestive gland in its dorsum, foot, rhinophores and cephalic tentacles. The cerata are moderately to greatly inflated (particularly in young animals) and they usually have iridescent-blue and/or orange subapical bands. The body and cerata are splotched with white. The ramifications of the digestive gland distinguish it from Baeolidia salaamica. Natural history: Baeolidia moebii is a moderately rare species that appears to be largely restricted to Halimeda kanaloana beds at depths of 8-9 m (26-30 m) on Maui (although it's been recorded from the low intertidal and shallow rocky habitats on Oahu by Scott Johnson and from 3 m (10 ft) in a Big Island marina by Paul Okumura). It is probably primarily diurnal and the extensive ramifications of its digestive gland suggest that it obtains significant nutrition from retained zooxanthellae. Gosliner (1973) reports it feeding on the sea anemones Boloceroides and Aiptasia. (Note 1) It lays a cream egg mass composed of a "slinky-like" ribbon. The eggs appear to hatch in about two days in the laboratory. Taxonomic notes: Some sites list this species as Spurilla major. It's listed as Berghia major in Kay, 1979, Gosliner, 1980, Bertsch & Johnson, 1981, Hoover, 1998 and Hoover, 2006. 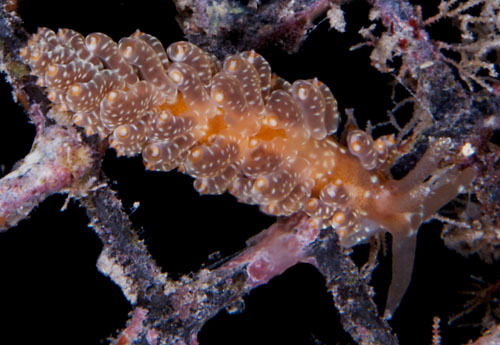 It's referred to as the "anemone-eating nudibranch" in Hoover, 1998 & 2006 although the photo is of Baeolidia salaamica (deleted in 5th printing). The photo of B. major in Bertsch and Johnson, 1981 is also of B. salaamica. It was first reported from Hawaii in Gosliner, 1980. Photo: Paul Okumura: about 25 mm; Honokohau Marina, Kona, Big island; May 19, 2013. Note 1: In Oct., 2010 a 9 mm animal was repeatedly offered juvenile and mature Bunodeopsis medusoides but showed no interest in that species (unlike Baeolidia scottjohnsoni).